efficiently they’re performing and exactly how to reduce production downtime. Take a tour then contact us to see how affordable it can be. Thrive is plug and play. We send you everything you need, and your team completes the install in just a few hours. There’s no server or PLC required, and our team is here for support. Know whether your lines are running, how efficiently they’re performing, and the cause and length of any downtime event. You can tell at a glance with our clean, easy to use dashboard. 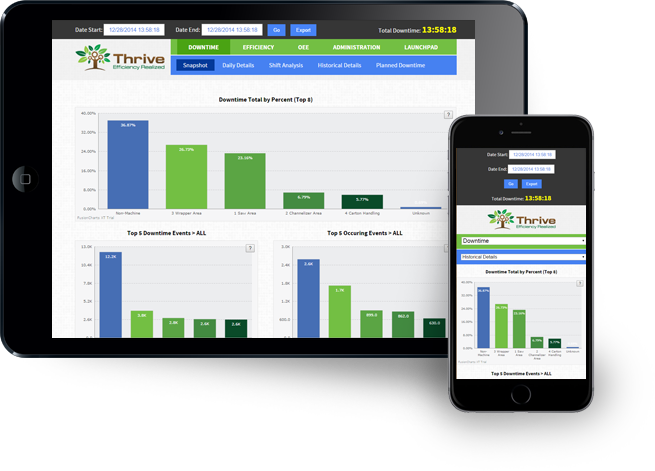 Thrive gives you the information you need to make data-driven decisions on equipment maintenance, purchasing new equipment and more. Our dashboard shows live and historical efficiency data, and our unique algorithm prioritizes downtime issues to help you maximize production. Built-in reports offer volumes of insight, giving you multiple ways to view the data and providing clear guidance on how to reduce downtime. In less than 10 seconds, operators can assign a reason code for any downtime event and provide optional comments, right from the shop floor. All it takes is a device with an Internet connection, including a tablet or smartphone. No two production lines are alike, which is why Thrive has an unlimited number of reason codes, including options for planned downtimes. Each layer can be configured to meet your needs, and our team is here to provide guidance and best practices. Reason codes are easy to add and update instantly. With only three levels of detail, operators can quickly assign a code and you can easily analyze the information. Too busy to log in? The daily downtime digest summarizes daily activity and is automatically emailed to you, just in time for breakfast. Export your data into a spreadsheet to create custom pivot tables and charts. Thrive’s API can also connect directly to your ERP, giving you real-time data exactly where you need it. 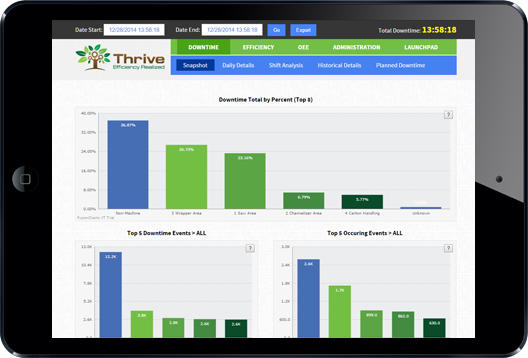 No matter how you prefer to work, Thrive’s dashboard has you covered. Too busy to log in for reports? The daily downtime digest summarizes daily activity and is automatically emailed to you. Have more time? Access the dashboard anytime, anywhere from any device with an Internet connection, including tablets and smart phones. Get a detailed, real-time view of overall equipment effectiveness. 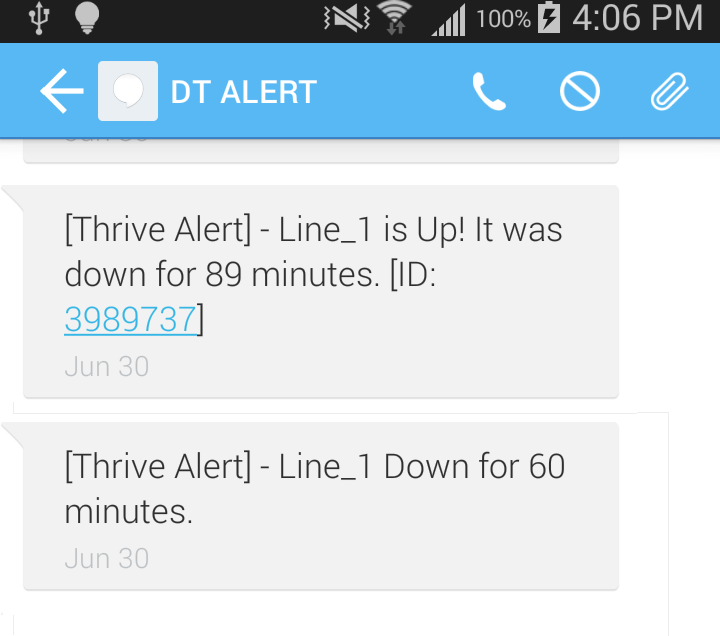 Receive a text message or email alert when a line goes down, and customize the timing of alerts based on your preference. Want to know right away? Set your preference for 60 minutes or less. Want to wait longer in case an operator finds the fix? You can do that, too.